Rowcroft’s efforts to ensure the hospice is dementia-friendly was recently highlighted at the Alzheimer’s International Conference when the work we have done with the Torbay Leadership Group was featured. Last year the group carried out an environmental audit of the hospice, looking at areas such as parking, signs and décor. The group also made a few recommendations for improvements, some of which have already been actioned. The Torbay Dementia Leadership Group is made up of people with dementia who want to improve the world for people with the condition. They conduct walk-through audits of doctors’ surgeries, churches and other public buildings. The visit was also applauded by The Alzheimer’s Society, who wrote, “This work champions people living with dementia as experts by experience and demonstrates how people can be enabled to influence specialist services.” Rowcroft was proud to hear that the visit had been included in a presentation at the Alzheimer’s International conference. We’ve worked with our local branch of The Alzheimer’s Society for many years. 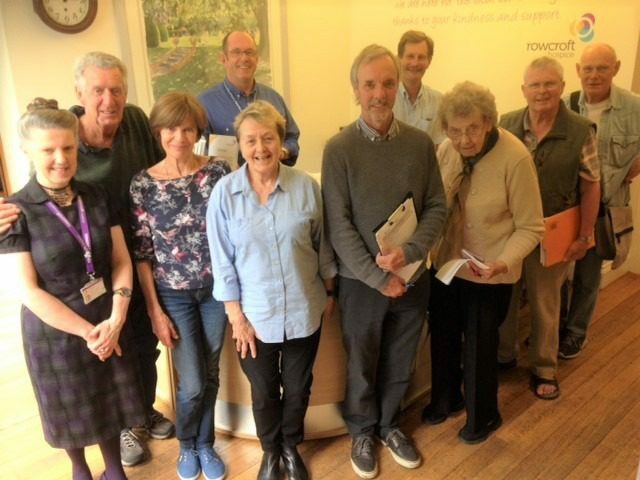 We partnered with the charity on a series of Special Interest Meetings, bringing together people who have dementia with Rowcroft staff and volunteers, GPs, care home workers and other Health and Social Care professionals. The Torbay Dementia Leadership Group attended some of the meetings and offered valuable advice. At Rowcroft, we already offer dementia awareness training to staff and volunteers, and we’re hoping to build on this in the future . We are also delighted to share that we play host to the Purple Angel Memory Café at Rainbow House every Friday. This is a weekly get together and activity group for local dementia patients and sessions include games, talks, music and dance.